Corinth of Paul‘s time was a very immoral city, where its people reveled in all kinds of vices, including sexual immorality [1 Cor 5]. It was an important centre of commerce, and hosted a temple of Aphrodite where priestess served as prostitutes as a form of worship to Aphrodite, the Greek equivalent to the Roman Venus, goddess of love, beauty, procreation and pleasure. Paul wrote the letter to correct the wrongs of the Corinth church, which was swept into the immoral culture of the city. Corinth was close in proximity to the great city of Athens, and intellectualism was commonplace in the city – there were plenty of intellectuals and scholars and people enjoyed debating about wisdom and pursuing knowledge. This led to difficulties within the leadership of the Church and the relationships of its members. Paul begins his letter by addressing the problem of the division within the church, a problem he recognised as being caused by the exaltation of human wisdom. He explains for Christ did not send me to baptize, but to preach the gospel—not with words of human wisdom, lest the cross of Christ be emptied of its power. [1 Cor 1:17] – and in other words, he tells the Christians of Corinth, let your allegiance lie in God and not in men. Today the Cross only bears significance to us because of Christ, but in the days of the apostles, when the Roman Empire is still in power, crucifixion was a very real and scary event. The cross bore the significance of death, cruel and torturous death, and the gospel was avoided just like how conversations of the cross was avoided. The Cross was bloody, shameful, torturous, frightful, wrong. Christ was tortured, scorned at, insulted, mocked, ridiculed, spat at, beaten up, accused, framed – and then hung up like a piece of trophy on two wooden planks for more condemnation. What is the message of the Cross? In our Christian concept it would go somewhat like this, probably ~ Jesus Christ who redeemed our sins through the shedding of his blood when he died on the cross for us. Hence, it is the message of Salvation, of the death of Christ our saviour. Many of the intellectually-inclined people of Corinth were unable to accept the gospel. The man without the Spirit does not accept the things that come from the Spirit of God, for they are foolishness to him, and he cannot understand them, because they are spiritually discerned. [1 Cor 2:14] They revel in their intellectual exchanges and debates, they excel in oration and investigation, and being puzzled by the message of the cross, they were unable to accept it. In this way, their wisdom have served as a stumbling block to accepting the gospel. Their wisdom was their downfall. The god of this age has blinded the minds of unbelievers, so that they cannot see the light of the gospel of the glory of Christ, who is the image of God [2 Cor 4:4]. Human wisdom is not bad – it is an important asset in life, an important advantage. But when one gets too blinded in their pursuit of worldly knowledge and loses sight of the cross, human wisdom becomes nothing more than an obstacle to the better life that they are seeking. Man’s wisdom have proven to be able to prevent wars, prevent epidemics, prevent conflict. The wisdom of Men maybe able to save lives, but the wisdom of God has the power to save souls. 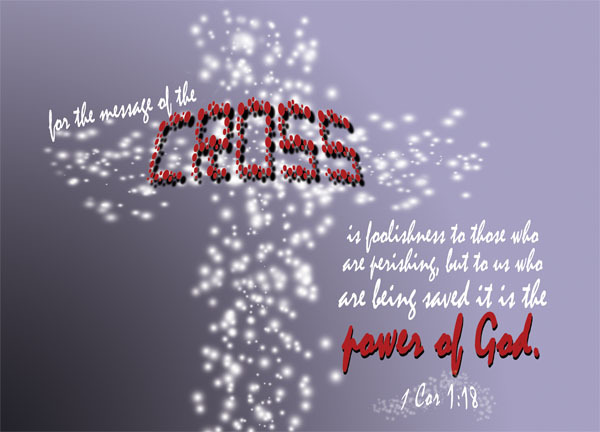 We’re told that the message of the cross is the power of God. Indeed, when we confess with our mouth, “Jesus is Lord,” and believe in our heart that God raised him from the dead, we will be saved. [Rom 10:9] Christ is the source of our wisdom, and his death is the highest expression of wisdom of God. When we cling on to our faith and believe in Christ, the wisdom of God empowers us. It is perhaps ironic, that as much as the disbelieving holds that the message of Salvation is foolishness, so too does God view the wisdom of the world. 1 Cor 1:25 says the foolishness of God is wiser than man’s wisdom, and the weakness of God is stronger than man’s strength. But that’s another perspective best left for another day. Do you pursue worldly knowledge? I always wondered, of all things he could have asked for, why did Solomon ask for wisdom? The Bible states that his answer was pleasing to God [1 Kings 3:10], but surely there were more textbook-like answers? I imagine that had he asked for more love, or more faith; God would have been pleased with him too. In the end, Solomon is probably still regarded as the wisest man in history, and he ruled as a wise King exalted by many. But the wisdom of man is but just folly if without the Lord. His many ungodly wives led to his downfall. At the end of the day, Solomon reflected on his life and concluded, vanity of vanities; all is vanity [Ecc 1:2|Article]. I regard Solomon highly, and his words have surely been a blessing to many. In the days when he feared God, he flourished, and his wisdom was a blessing to his people. In his own words, the fear of the LORD is the beginning of wisdom, and knowledge of the Holy One is understanding [Proverbs 9:10]. In the eyes of those who do not have the understanding of the Spirit in their hearts, the message of the cross is foolish. Indeed, our faith to them is foolish, for our faith is being certain of what we do not see [Heb 11:1|Article]. Let us take heart even when our faith is scoffed by the worldly wise men. Intellectuals and Scientists will always refute the gospel, for they are too wise in the worldly matters that they lack the spirit’s discernment to understand the message of the cross. But for us, who have been saved, it is the power of God. Thanks for visiting my blog. Keep up the good work you are doing here. Excellent again, you give me much to think about, I thank you! Thank you for a most relevant post. It’s great that you provided different view points for the saved and the perishing.